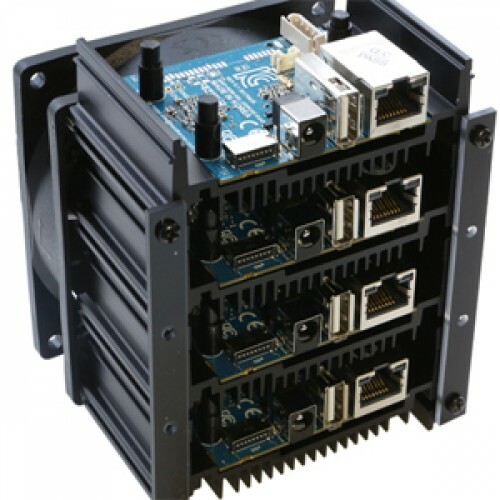 It consists of 4 stackable units, each with a specially designed Single Board Computer (SBC) based on the Samsung Exynos 5422 octa-core processor. The OS is compatible with the ODROID-XU4, and is mounted on an aluminum case. The cases (which also incorporates an integrated heatsink) are stacked with a 80mm USB-Fan attached on the back-end, to ensure adequate cooling. The ODROID-MC1 comes assembled and ready to use as a personal cluster for learning as well as for doing useful work. This affordable 32-core cluster computer can run Docker Swarm, Build Farm and many other parallel computing applications. * 4 units are fully assembled with a cooling fan. * Each unit has Gigabit Ethernet port for clustering. * Size : 112 x 93 x 72 mm approx.